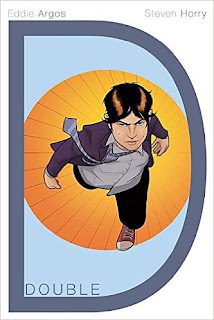 Our book is called Double D and is about an overweight schoolboy who discovers he can use his excess body weight to fuel super heroic abilities. The book is coloured by David Cooper, lettered by Colin Bell and edited by Alex Sarll. An AMAZING TEAM. It is released Wednesday 11th November. Once you've read those previews you should go and order a copy. Thanks. FORMED A BAND PAINTINGS FOR SALE.